How will you sleep at night? Test your moral cunning as you contend with tyrannical state forces and ordinary people in a suspenseful dystopian strategy game. Take on the role of a government-installed landlord, working as a spy for the totalitarian state in this unique twist on the strategy genre from Russian developer Alawar. Your job is to spy on tenants, peep into their lives and create profiles on everyone to ensure strict obediance to state law and keep your tyrannical superiors satisfied. Set in a dystopian world where privacy is dead and the state controls everything, you must decide between your insidious duties and your basic human empathy. All your choices will have consequences - who or what will you sacrifice? Beholder Complete Edition also includes the Blissful Sleep DLC - a new scenario based on an ex-landlord, with all new tenants and stories to discover. Spy on your tenants, eavesdrop on their conversations, bug their apartments and search through their belongings. Blackmail your neighbours, using what you've learned to your benefit - but remember, they won't take kindly to this. Befriend your marks, understand their needs and use them to your benefit - but beware of how the state may view this. Deal with the consequences - all choices will come back to you in the long run and some may be deadly. 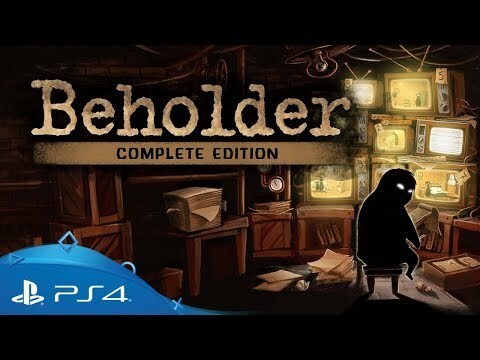 Buy Beholder Complete Edition on PS4. Looking for something with atmosphere? Struggle to keep yourself and your family alive in a post-apocalyptic wasteland in Sheltered on PlayStation 4.